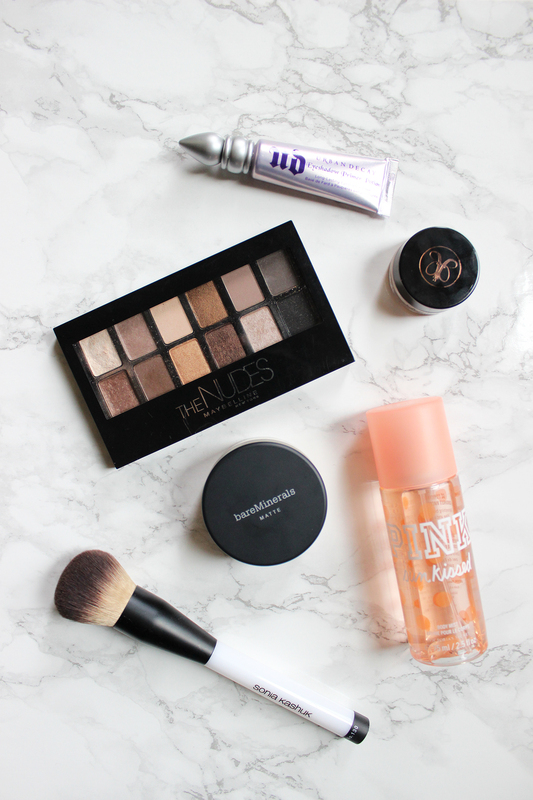 If you’re a blogger, there’s a good chance you’ve taken a flat lay photo. White backgrounds have been the most popular choice for a while now, but it looks like white marble is making its way to the top! I was always jealous of these bloggers with perfect marble countertops in well lit kitchens, until I realized that most of them weren’t using real marble at all! 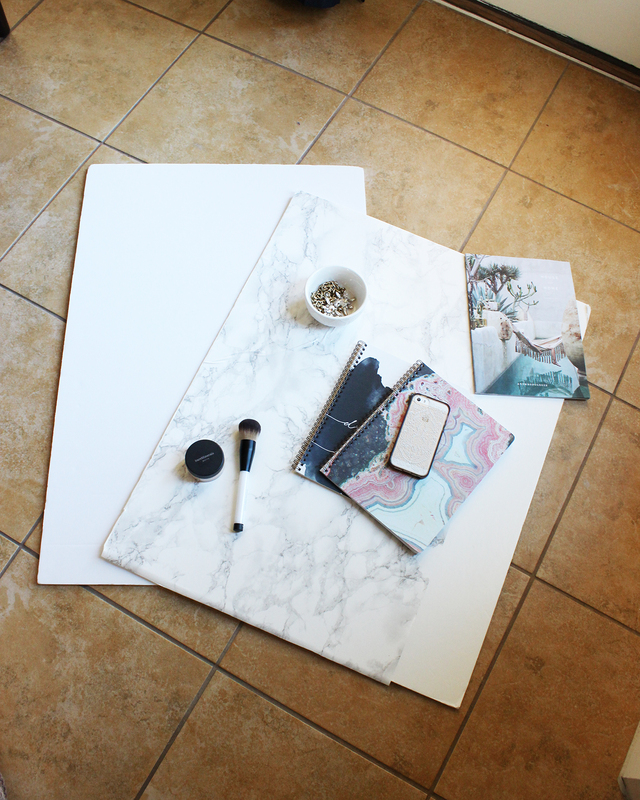 Creating your own marble background is a lot easier than you might think. I made my own this week and have already put up some fun shots on my Instagram. It cost me about $10, and today I’m going to show you how to make your own! The secret to this background is marble contact paper. I purchased mine on Amazon (you can find it here), and if you have Amazon Prime shipping is free! You’ll also need a surface to place the contact paper on. I used one of my extra white foam boards, but I’ve heard that plexiglass is another great option. First, you want to make sure whatever surface you’re attaching your paper to is clean. You want to minimize any bumps underneath the paper, so even a strand of hair could mess things up. Next, measure out your paper to match the size of your surface. You can make your background as big as you want, but if you’re only taking photos of small objects like makeup products or desk supplies, you really don’t need much space! I covered a little over half of my board with the paper, which was the full width of the roll itself. Cut out the measured piece of contact paper and place the rest aside. This is the step where things get tricky with only one pair of hands, so if you have someone else around to help you out, this will go a lot smoother! The strategy with placing the paper on your surface is taking things very slowly to avoid bubbles forming. I did this step myself and ended up with several bubbles, but that also taught me that this stuff is pretty easy to lift up and reposition if you mess up! Match up the corners of your paper with the surface, and while one person is holding the surface in place and removing the backing of the paper from itself, the other should be pressing the paper down onto the surface and smoothing out any bubbles. Make sure you’re not tending towards one side with the paper, or you’ll end up with creases in the middle of the surface. If you have any extra paper on the sides of your surface, take a razor to trim it off. Remember, none of this has to be perfect because all that matters is the middle portion of the surface where you’ll be taking your pictures! If you have any questions let me know in the comments! I’m also looking for new backgrounds to experiment with, so feel free to leave any suggestions you have!